You can wait until next year – but it will probably cost you. Our natural tendency, especially on a larger purchase, is to wait. Electronics, like TVs and cell phones, still keep getting better, and last year’s amazing technology at a high price is now run-of-the-mill and on-sale. Sometimes, we may wrongly apply that same thinking to other topics, including real estate. We wait, because tomorrow may hold a better deal, and who knows what will happen a year from now? The reality of the housing market is that you’re going to miss out if you wait. Prices continue to trend upwards, and interest rates are incredibly low. 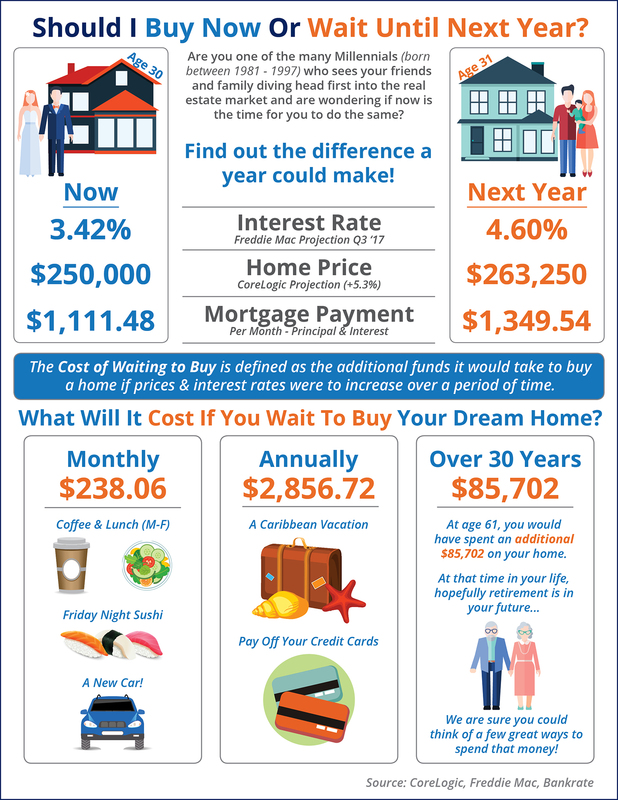 Waiting a year will mean a higher price point for the same house, most likely a higher interest rate (and therefore payment), and you will have burned another year of expenses while waiting for that “better deal”. For example, if you are currently renting at $1000 / month, in one year you will have spent $12,000 on rent alone. That’s 5% of the purchase price of a $240,000 home. That’s a sizeable amount of equity to give up while waiting for the “right” time. To borrow a phrase from J. Massey, the time is “Now 0′ clock”. It’s time to get started – contact me today!